Mesenteric angiography is a test used took look at the blood vessels that supply the small and large intestines. Angiography is an imaging test that uses x-rays and a special dye to see inside the arteries. Arteries are blood vessels that carry blood away from the heart. This test is done in a hospital. You will lie on an x-ray table. You may ask for medicine to help you relax (sedative) if you need it. During the test, your blood pressure, heart rate, and breathing will be checked. The health care provider will shave and clean the groin. A numbing medicine (anesthetic) is injected into the skin over an artery. A needle is inserted into an artery. A thin flexible tube called a catheter is passed through the needle. It is moved into the artery, and up through the main vessels of the belly area until it is properly placed into a mesenteric artery. The doctor uses x-rays as a guide. The doctor can see live images of the area on a TV-like monitor. Contrast dye is injected through this tube to see if there are any problems with the blood vessels. X-ray images are taken of the artery. After the x-rays or treatments are finished, the catheter is removed. Pressure is applied to the puncture site for 20 to 45 minutes to stop the bleeding. After that time the area is checked and a tight bandage is applied. The leg is most often kept straight for another 6 hours after the procedure. You should not eat or drink anything for 6 to 8 hours before the test. You will be asked to wear a hospital gown and sign a consent form for the procedure. Remove jewelry from the area being imaged. You may feel a brief sting when the numbing medicine is given. You will feel a brief sharp pain and some pressure as the catheter is placed and moved into the artery. In most cases, you will feel only a sensation of pressure in the groin area. As the dye is injected, you will feel a warm, flushing sensation. You may have tenderness and bruising at the site of the catheter insertion after the test. A mesenteric angiogram may be performed after more sensitive nuclear medicine scans have identified active bleeding. The radiologist can then pinpoint and treat the source. Results are normal if the examined arteries are normal in appearance. A common abnormal finding is narrowing and hardening of the arteries that supply the large and small intestine. This is called mesenteric ischemia. The problem occurs when fatty material (plaque) builds up on the walls of your arteries. Cirrhosis is scarring of the liver and poor liver function. It is the last stage of chronic liver disease. A tumor is an abnormal growth of body tissue. Tumors can be cancerous (malignant) or noncancerous (benign). 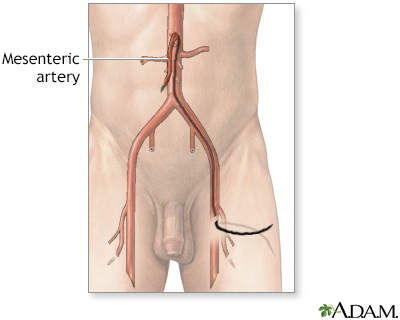 There is some risk of the catheter damaging the artery or knocking loose a piece of the artery wall. This can reduce or block blood flow and lead to tissue death. This is a rare complication. Desai SS, Hodgson KJ. Endovascular diagnostic technique. In: Sidawy AN, Perler BA, eds. Rutherford's Vascular Surgery and Endovascular Therapy. 9th ed. Philadelphia, PA: Elsevier; 2019:chap 60. Lo RC, Schermerhorn ML. Mesenteric arterial disease: epidemiology, pathophysiology, and clinical evaluation. In: Sidawy AN, Perler BA, eds. Rutherford's Vascular Surgery and Endovascular Therapy. 9th ed. Philadelphia, PA: Elsevier; 2019:chap 131.
vd Bosch H, Westenberg JJM, d Roos A. Cardiovascular magnetic resonance angiography: carotids, aorta, and peripheral vessels. In: Manning WJ, Pennell DJ, eds. Cardiovascular Magnetic Resonance. 3rd ed. Philadelphia, PA: Elsevier; 2019:chap 44. Mesenteric arteriography is an examination of the abdominal vessels by using an injection of a contrast medium to help visualize the structures. The test is performed after an endoscopy proves to be inconclusive and cannot locate the source of bleeding in the intestinal system, or other studies prove inadequate in evaluating abnormal growths. It may also be used to evaluate vessel damage after an abdominal trauma. Reviewed By: Mary C. Mancini, MD, PhD, Director, Cardiothoracic Surgery, Christus Highland Medical Center, Shreveport, LA. Review provided by VeriMed Healthcare Network. Also reviewed by David Zieve, MD, MHA, Medical Director, Brenda Conaway, Editorial Director, and the A.D.A.M. Editorial team.